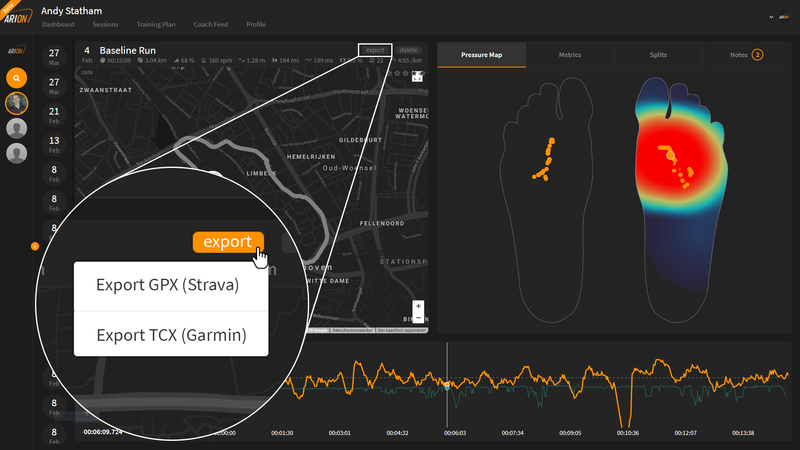 Learn how to export you data in either a .tcx or .gpx format. You can export your data only from the web dashboard. Open it up via this link and log in using the same credentials as in the app. Go to the 'Sessions' tab and select the session you would like to export. You'll find the export button in the top right corner of the map section (see image below), next to the delete button. Choose either one of these options and your export file will start downloading. Please understand that we only release the raw pressure data to our research partners, and only with a signed non-disclosure agreement (NDA) in place. If you're interested in doing research with the ARION system, please send us an email at info@ato-gear.com along with a description of the project and we'll see what we can do to help you.